An Exquisite piece of art-work for you! 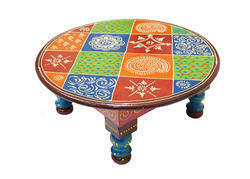 A beautiful medley of colors & design the breathtaking colors and traditional designs with traditional Indian motifs make this chowki (Table) a fabulous Artifacts, Hand Craft Artifacts by the revered artisans of Rajasthan (India). Our offered Wood Printed Bajot is a perfect choice for gifting purposes that will create an everlasting memory.